Seen here is Sakura Miku-chan eating her onigiri. My mornings are usually like this – very early, leisurely, and yummy. I love to wake up early because I can do more and I don’t need to hurry up to get ready for work. -they are more optimistic and such. To me, I have this quiet moment wherein I can post an entry to my blog, watch two to three episodes of anime downloaded overnight, and I come to the office earlier than expected. It reduces your stress level too since you don’t need to hurry for work and when you arrive, you can still relax before starting your actual work. Sakura-chan here is quite energetic but she goes to bed early and wakes up early. I eat my favorite bread while she munches on that　かわいいおにぎり (kawaii onigiri). 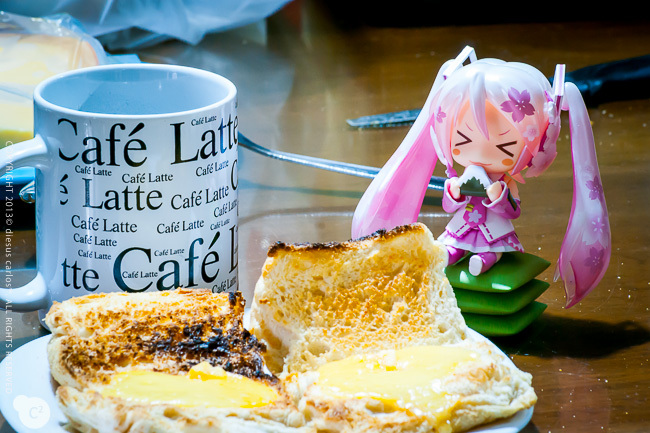 Posted in Figure/Doll Photos, Nendoroids, UncategorizedTagged breakfast, coffee, good smile company, hatsune miku, kawaii, miku, nendoroid, nendoroids, onigiri, sakura mikuBookmark the permalink.